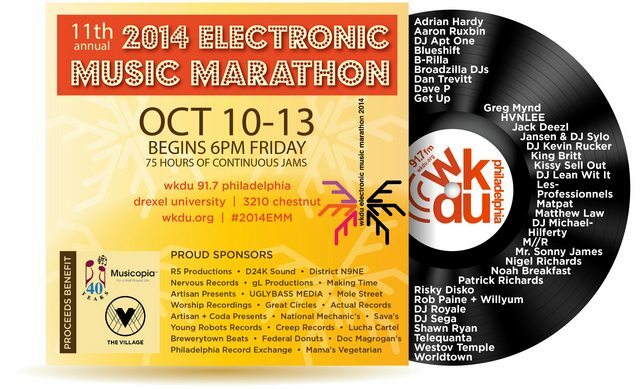 After 7 years on hiatus, the WKDU Electronic Music Marathon is back. This year's installment will be the 11th Electronic Music Marathon and will take place on October 10th through October 13th, 2014. Tune in through 91.7FM in Philadelphia or our stream. Mirrors available at Soundtap, Tunein, and Streema. Get your EMM merchandise or make a donation! All proceeds benefit The Village of Arts and Humanities, Musicopia, and WKDU.